When Albert Borella journeyed from the Tennant Creek area to Darwin in January and February of 1915, he used a number of modes of travel to reach his destination. Over the 1,000 kilometre trek, he walked, rode a horse, hitched a ride on a horse drawn mail cart and, finally, boarded a train. One hundred years later, The Borella Ride retraced Borella’s journey to volunteer in World War I, by travelling along the Stuart Highway, arriving and departing each location with a symbolic re-enactment of the mode of transport he used. Albert Borella was represented by his grandson, Richard Chalmers-Borella, who was accompanied by two companion Riders, Tim George and Charlie Cloos. The Borella Ride departed Tennant Creek on 20 February 2015 and arrived in Darwin on 3 March 2015. Borella’s original journey from Tennant Creek to Darwin would have taken him almost two months to complete. 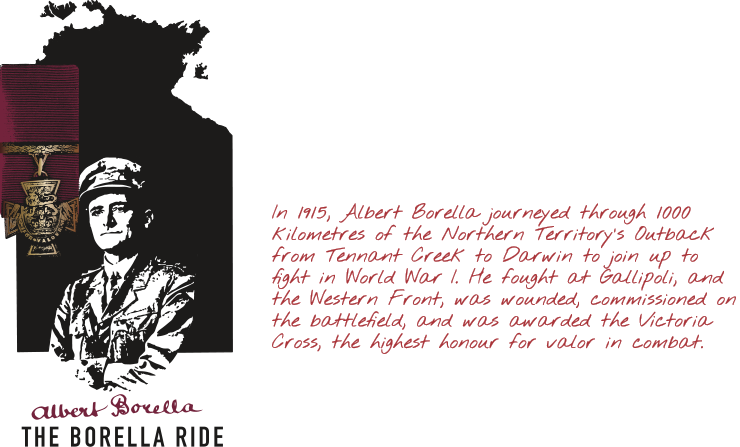 When Albert Borella VC arrived in Darwin after his 1,000 kilometre journey, he found he couldn’t enlist. At the time the government wasn’t taking enlsitments from the Territory, so Borella had to continue on to Townsville by ship, where he enlisted on 15 March 1915. To find out more about each mode of travel, click on the links below.